Gerard Pique takes on Real Madrid: Will it ever end? Even when he's halfway around the world, Gerard Pique just cannot let it lie. The Barcelona defender's running verbal battle with most of the Real Madrid squad continued in Japan on Wednesday as he refused to back down after igniting yet another row, this time with Bernabeu duo Alvaro Arbeloa and Sergio Ramos. We all know there's little love lost between Barca and Madrid, but no figure on the pitch seems to embody the rivalry more closely than Pique. Right now, he's almost 6,500 miles away in Yokohama, where Barca enter the Club World Cup at the semi-final stage on Thursday, but Real are seemingly very much on his mind. He has been booed by Spain supporters angry at his anti-Madrid stance, he's been told to grow up and to show more respect. But will Pique change his ways? Here's the story so far. Picture the scene. You're celebrating winning the league title, an occasion to savour. But for Pique, this is an opportunity to score points against your bitter rivals. "We are the best team in the world! Thanks to all and thanks to Kevin Roldan... everything started with you," he told the club's buoyant fans. Don't get the reference? Back in February, Colombian pop star Roldan performed at Cristiano Ronaldo's 30th birthday party - and posted some pictures on social media. Over the months that followed, there was meltdown in the Spanish capital - and Barcelona went on to win the league, Copa del Rey and Champions League. The Roldan comments didn't exactly endear Pique to the Madrid fans around Spain. And there are quite a lot of them. So many in fact that when Pique next turned out for the national team in a friendly against Costa Rica in June, sections of the home crowd jeered and whistled him. 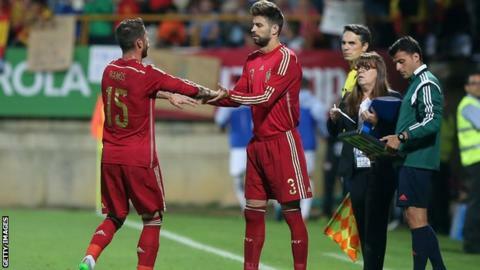 After Spain supporters repeated the trick in September, Pique was sticking to his guns. "I don't regret anything that I have said and I would repeat it a thousand times and more," he said. "I am like that. I feel very good, on both a personal and sporting level. Yesterday I went mushroom picking. I am a happy man." Round three: More than a good sense of humour? Football, eh? Sometimes you just have no idea what to expect. Who could have said Real Madrid would be thrown out of this season's Spanish cup for fielding an ineligible player? Rafael Benitez's side picked the suspended Denis Cheryshev for the first leg of their last-32 tie with Cadiz and - despite appeals - they are out of a competition they have won 19 times. You can probably guess who saw the funny side. Pique's tweet in reaction - shown above - didn't have a single word. Instead, he let the emojis do the talking. Round four: Arbeloa insulting me? For Arbeloa, this was the final straw. The Madrid full-back hit back at Pique, claiming he was "obsessed" with the club from the capital. Pique's reaction? Raising the stakes to word play. "Arbeloa insulting me? He said he is my friend, but he's not, he's just someone I know," Pique replied. And so to the latest episode in this bubbling saga. Speaking in a news conference on Wednesday, Pique had more questions to answer. Two more Real Madrid figures had added their voices to those calling on the 28-year-old to show more respect. "Forget about your complexes and respect your elders," former Real and QPR midfielder Esteban Granero, now at Real Sociedad, told Pique. Real captain Ramos also jumped to Arbeloa's defence with this pearl of wisdom: "Lack of respect for one's peers is an enemy which works against good atmosphere. Pique should have a bit of respect for Real Madrid." The reply? Pique seemed to hold his tongue and go on a bit of a charm offensive. "The role of Sergio Ramos is normal for a captain. He is the Real Madrid captain and a great captain. He came out to defend his team-mate and I honestly admire him for that," he said. Maybe, then, there are signs of this row being put to bed. Until the next time that is. Real and Barca meet again on 3 April at the Nou Camp. So there's lots of time for there to be plenty more fireworks before then.